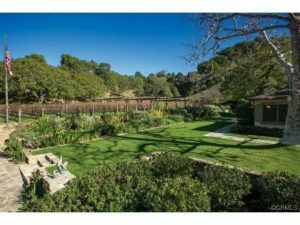 Bel Air (Spiritsman) 7/4/17/—The number of wineries in the greater Los Angeles area can be counted on one hand like Malibu, Rancho Cucamonga and the San AntonioWinery downtown. One of the ones not so well known is Moraga Estates in Bel Air. 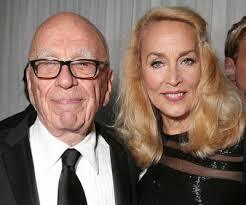 It is only open to wine club members maybe once or twice a year, production is limited to 900 cases a year, and yes the owners Rupert Murdoch and,Jerry Hall take a keen interest in the day to day operations. Scott,Rich is the winemaker and Carlos Contreras is the Vineyard Manager, and this is a team that knows how to work with the unique terrestrial and climatic conditions on offer. At a private press reception on a chilly but pleasant May evening, I got to see the operation including the famous cave, probably the only one in Los Angeles and the best places to hide during any unforeseen nuclear blast from the likes of North Korea. 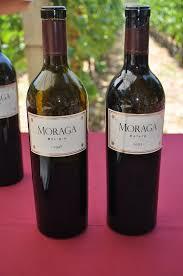 The 2013 Moraga Red Wine was produced with only a skimpy 4 inches of rain that growing season. This meant that the crop load in June was quite substantial for such a small acreage and the slightly warmer temperatures produced grapes with a lot of tannins. Fruit is picked very early morning to ensure that the grapes are processed cold, and the grapes that were not fully colored were removed. Next up came pre-fermentation maceration over an extended period to optimize the flavors and tannins. Then the wine is drained into small tanks overnight before ending up in French oak barrels. The whole process of picking to barreling takes a maximum of 46 days. After bottling in August 2015 the wine has just been released and as expected will be sold out fairly promptly. What we have here is a wine that comes from a very special place in many ways and a crew or team who go to extraordinary lengths to get it right. Obviously with an owner like Murdoch, nothing is done on the cheap and the result is a wine that is soft on the palate but with plenty of fruit. aroma’s range from cassis, briar and cocoa with subtle hints of sandalwood, pipe tobacco and even wet sandstone. The 2015 Sauvignon Blanc from Moraga was a much simpler process than the red with 20% of the juice going into new French oak barrels and the remainder into stainless steel barrels. After three weeks all the wine made it to the stainless steel barrels and then spent 11 months on the lees. To learn more about the wines or to become a member go to.